The ADAPTIL Diffuser contains a synthetic copy of the apeasing pheromone secreted by mother dogs to comfort their puppies. 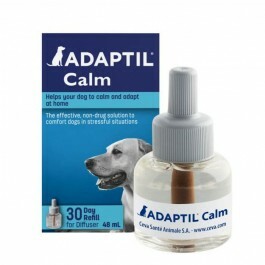 ADAPTIL has been clinically proven to reduce signs of stress in dogs and puppies. Duration of Action: 30 days for this 48ml refill (may vary depending on the electrical voltage and air flow in the room where the device is connected). Simply screw the vial onto the diffuser unit and plug it into an electric socket. The vials should be replaced every month (24ml vial) or every two months (48ml vial) by purchasing the Diffuser Refill. Read the package leaflet before use. Keep out of reach of children. ADAPTIL Diffuser may be used with any other presentation of ADAPTIL, including the spray, collar or tablets.